The color or décor of a room can change its atmosphere from dull to cheery, drab to welcoming, bright to relaxing. A fresh coat of paint or new wall covering can make all the difference. We can paint one or all of the rooms in your house, townhouse, condo, office, or business. We work quickly and efficiently so as not to interrupt your life and leave your home disturbed for long periods of time. We can paint the outside of your commercial or residential building quickly and efficiently. We choose our paint for its quality and longevity, and we take the time to prepare all surfaces so you’ll have a long-lasting high-quality paint job. We repair or remove old style popcorn ceilings and replace with today’s popular knockdown texture. 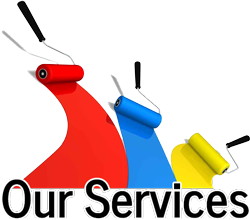 Master Painters specialized in painting and restoring furniture and fixtures. Whether it’s your kitchen cabinets, bronze fixtures, your beloved master bedroom dresser, or an end table, we’ll bring your favorite furniture back to life – reducing time and expenses to where you’d have otherwise bought brand new.